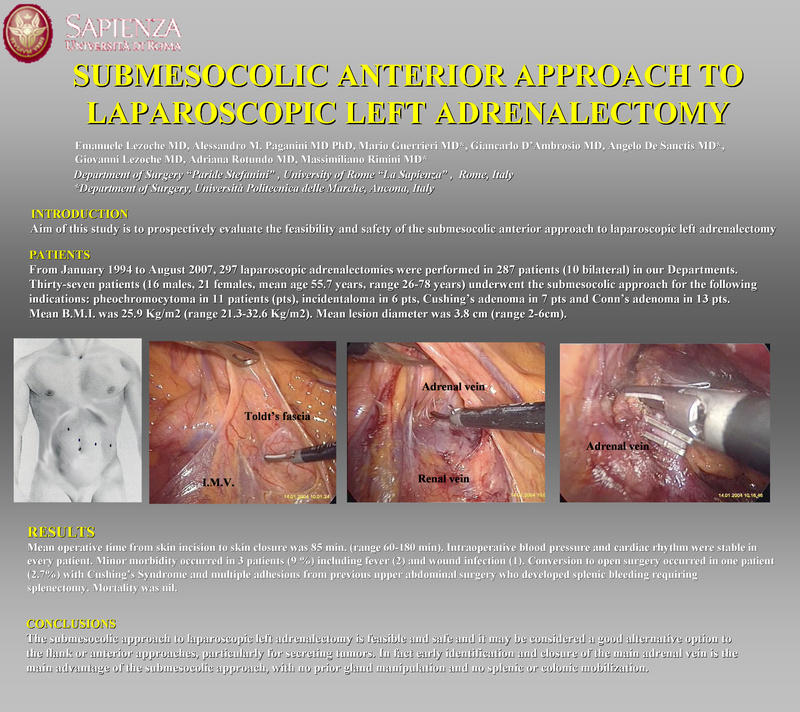 INTRODUCTION: Aim of this study is to prospectively evaluate the feasibility and safety of the submesocolic anterior approach to laparoscopic left adrenalectomy. METHODS: From January 1994 to August 2007, 297 laparoscopic adrenalectomies were performed in 287 patients (10 bilateral) in our Departments. Thirty-seven patients (16 males, 21 females, mean age 55.7 years, range 26-78 years) underwent the submesocolic approach for the following indications: pheochromocytoma in 11 patients (pts), incidentaloma in 6 pts, Cushing’s adenoma in 7 pts and Conn’s adenoma in 13 pts. Mean B.M.I. was 25.9 Kg/m2 (range 21.3-32.6 Kg/m2). Mean lesion diameter was 3.8 cm (range 2-6cm). RESULTS: Mean operative time from skin incision to skin closure was 85 min. (range 60-180 min). Intraoperative blood pressure and cardiac rhythm were stable in every patient. Minor morbidity occurred in 3 patients (9 %) including fever (2) and wound infection (1). Conversion to open surgery occurred in one patient (2.7%) with Cushing’s Syndrome and multiple adhesions from previous upper abdominal surgery who developed splenic bleeding requiring splenectomy. Mortality was nil. CONCLUSIONS: The submesocolic approach to laparoscopic left adrenalectomy is feasible and safe and it may be considered a good alternative option to the flank or anterior approaches, particularly for secreting tumors. In fact, early identification and closure of the main adrenal vein is the main advantage of the submesocolic approach, with no prior gland manipulation and no splenic or colonic mobilization.